Our cottage Visthusboden (for max. 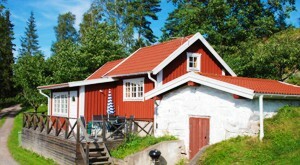 4+2 people) has a sauna and is located on a hillside high over the lake Bunn. 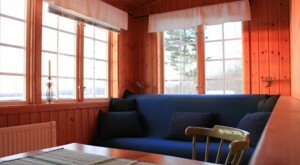 There is a terrace with a seating area in front of the cottage and our boathouse down by the lake is only 400m away. 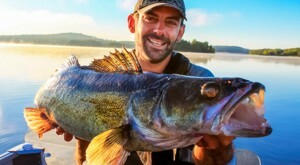 Especially the middle (Mellan Bunn) and northern (Norra Bunn) parts of lake Bunn are suitable for fishing large zander. 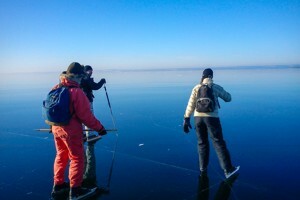 Our cottage Visthusboden in Schweden is located right where these two parts of the lake meet. 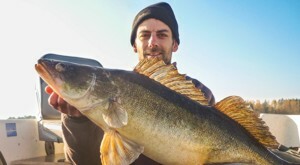 The picture to the left: Zander caught in Norra Bunn by the cottage. The cottage (in the foreground) offers incredible views over lake Bunn and the whole area. Especially the sunsets over the lake are dramatic. All the photos shown in this overview can be found in a larger format in our photo gallery. 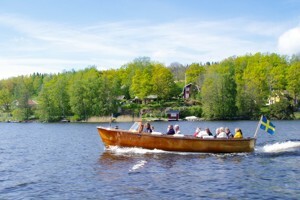 A row boat is already included in the cottage price. If you'd rather not row you can rent an extra electric or petrol engine from us. The petrol engine is rented on a first-come, first-served basis and since it comes with the larger boat(about 4,2m) it's worth being fast. If you are not the first to rent, you can still use the electric engine and the slightly smaller (about 4,0m) boat. Our boathouse is only about 400m away from the cottage, along a private road. The row boat included in the cottage rent is waiting here and this is a good place to keep your fishing gear. 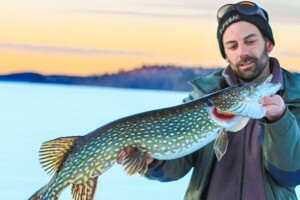 Would you rather rent a canoe or a kayak? No problem, please just ask us. Lovely views over the lake await you from the cottage itself or from the terrace in front. In the picture to the left you'll see the view from the window of the entrance. Please click on the photo to make it bigger and our photo gallery will open in a new window or tab. 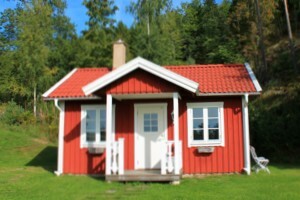 In the living area of the cottage Visthusboden at lake Bunn in Sweden you'll find a small kitchen table and a convertible sofa bed for 2 people. The terrace right in front of the cottage has a barbecue and seating area for you to relax. 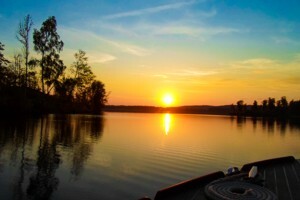 This is the perfect spot for a barbecue in the evening sun where you could eat self-caught fish from lake Bunn. 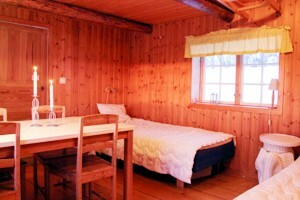 The bedroom contains a second larger table with 4 chairs and 2 single beds. Above this is the sleeping loft with a double bed. A foldable ladder leads there and is pictured in the upper right hand corner of the photo on the left. Please note that the sleeping loft is directly connected to the bedroom. 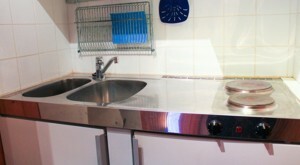 The small kitchen/pentry of the cottage has a refrigerator, electric stove with two stove plates, a small toaster oven, kettle, toaster, sandwich maker, coffee machine, plates, pans, pots, cutlery and everything else you might need. Going left from the kitchen you get to the bathroom with a shower, sauna and toilet. 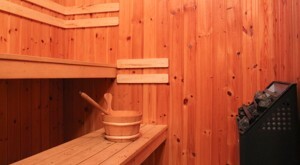 Enjoy the electrically heated sauna with an adjacent shower in the hallway outside the sauna. A separate toilet can be accessed through a door. 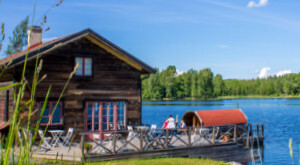 Sauna lovers can also choose to rent our optional floating lake sauna, waiting for you down by the boathouse. 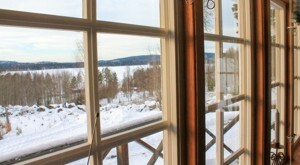 Even from inside the cottage sauna you can enjoy the views over lake Bunn. 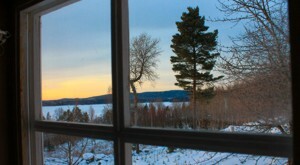 This is thanks to the small window in the top part of the sauna - check out the view in the photo on the left. All photos shown here can be found in a larger format in our photo gallery. If you need more room, for example an extra bedroom or simply want more privacy you can book our small guest house, located about 30m away, as an extra (see price list). 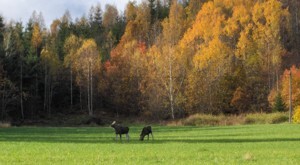 The guest house is completely independent thanks to a bathroom with shower, a small kitchen and a bed for 2 people, but it can only be booked together with our cottage Smedjan or our cottage Visthusboden. To the photos of the guest house. The days marked in red in the booking calendar are already booked by someone else. Please choose one of the vacant periods. 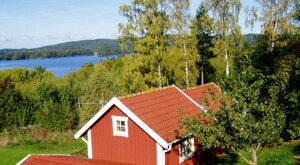 If our cottage Visthusboden should already be booked please see if our other cottage at lake Bunn is still available during your requested period or take a look at the booking calendar for our other cottages in Sweden with lake view.